The Nationals beat the Pirates 3-2 on Saturday. Here’s what you need to remember as the two teams square up again on Sunday afternoon. 1. Two runs in the eighth inning allowed the Nationals to walk away with a curly W against the Pirates on Saturday afternoon. Because of outfielder Adam Eaton and second baseman Howie Kendrick’s back-to-back home runs, Nats fans were able to leave the ballpark smiling. 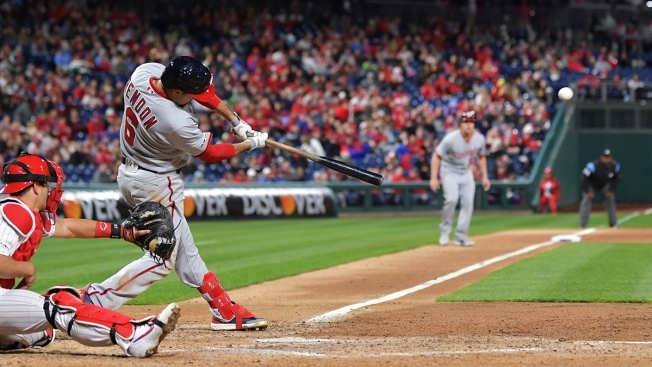 In fact, Washington Capitals defenseman Brooks Orpik scored a game-winning goal right before Eaton’s at-bat, causing D.C. sports fans to go wild at Capital One Arena and Nats Park, so maybe Orpik’s goal gave Nats fans energy, giving Eaton some extra strength. So, thank you, Orpik. 2. Aside from Eaton and Kendrick’s solo home runs, Kurt Suzuki was the only other National to drive in a run. The catcher has scored two runs and recorded five hits in his first 19 at-bats of the 2019 season. 3. Saturday’s game saw third baseman Anthony Rendon extend a career-high hitting streak to 12 games. This season so far, he has six home runs under his belt, along with 16 RBIs and a .412 batting average. Download the MyTeams app for Nationals news, plus get up-to-date information on all other D.C. teams. The Sunday Nationals vs. Pirates will be game broadcast on 106.7 the Fan and MASN2.